All of our whitewater and Lake kayak/canoe trips are small and highly individualized experiences that are suitable for children 5 years old and up. All trips include transportation from our location in Telluride. Morning trips meet at 8:00 am and afternoon trips will meet at 1:00 pm. 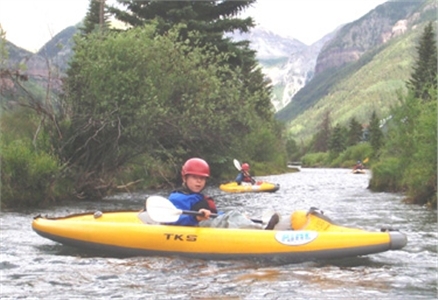 Please visit our website for more information www.kayaktelluride.com. 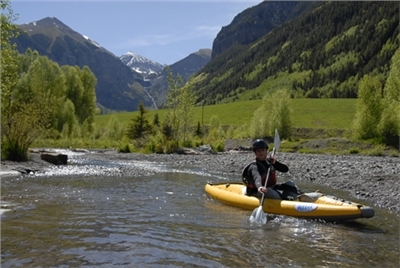 Just minutes from the town of Telluride "The Canyon" section of the San Miguel River offers a wild ride for adrenaline seekers. 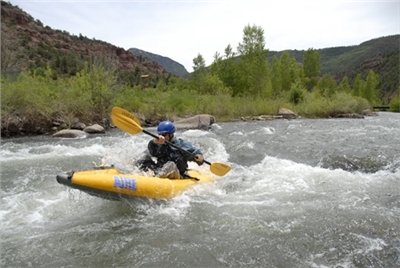 We'll start with going to one specific training spot on the San Miguel River where we'll learn the fundamentals to control our kayaks. Once we feel comfortable paddling our kayaks from the downstream current into "eddies", we will drive 10 ten miles down valley to our put- in. From the start the San Miguel is swift and continuous so it is crucial that you watch for your guide's signals and follow his line through the rapids as you go down stream. The entire length of the San Miguel Canyon is 30 miles and can be broken up into an 8 mile 1/2 day or a 20 mile full day. For those who want a full day of action the second half the day will be slightly more difficult containing class III+ rapids. If you and your group is showing impressive skills after the morning river section and you're "chomping at the bit" for the biggest rapids we can go 7 miles up stream from our put-in and run the Sawpit section which is class IV- during peak flows high water! This is a great local adventure that won't take up your whole day. We will start with an introduction and fitting of the necessary equipment at our boat house located upstairs in the Jagged Edge Building and then it is off to the river. Starting near the bottom of lift 7 on the Upper San Miguel River we will wind through the stunning and recently preserved Valley Floor. If we're lucky we'll get to see the heard of elk that call the Valley Floor Preserve their home during the summer months. 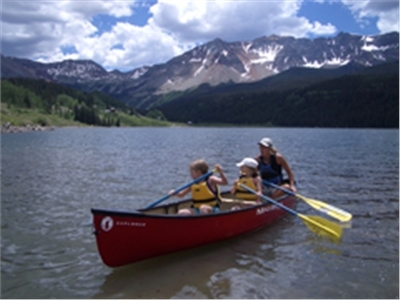 Trout Lake is nestled high in the San Juan Mountains above Telluride at almost 10,000 feet. This historic lake provides the perfect backdrop for half-day excursions. With breathtaking views of the surrounding San Juan Mountains, Trout Lake is rich in both natural and cultural history. We offer a variety of ways to explore this tranquil and beautiful alpine lake. In a canoe we can introduce the youngest paddlers to a safe and engaging paddling experience, while the more adventurous can try their hand at hardshell kayaking or Stand-Up Paddling. Cancellation | Cancellations for day trips can be made without penalty 48 hours prior to trip departure. Cancellations for multi-day trips can be made without penalty 14 days prior to the trip departure. If TKS cancels a trip for any reason (inclement weather, etc...), we will refund your deposit minus administrative fees incurred. Deposit | 50% non-refundable deposit at the time of booking, remaining payment is due 7 days prior to the trip launch date.